The holidays are starting early this year as the Season of Xbox will begin on November 2, when Xbox One will be available for a special, limited-time promotional offer of $349 in the U.S. Special promotional pricing of $50 off the console of your choice applies to any Xbox One console, including special edition bundles, offering some of the year’s most anticipated games - Assassin’s Creed: Unity, Call of Duty: Advanced Warfare and Sunset Overdrive. With Xbox One available at its best price yet, and savings up to $150 off select bundles, there’s never been a better time to own an Xbox One. 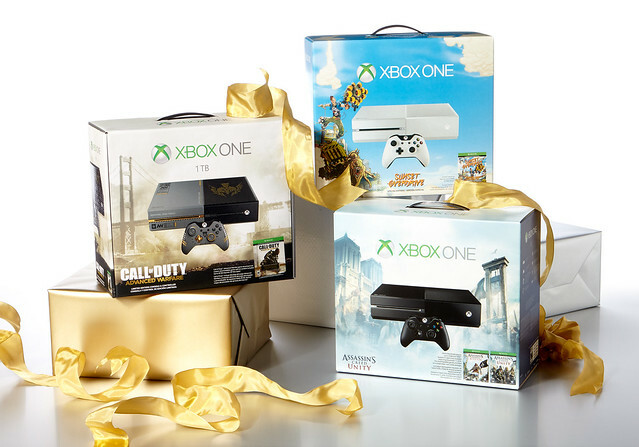 *$50 off any Xbox One console or bundle. Offer valid November 2, 2014 through January 3, 2015 at participating retailers. Sunset OverDrive Bundle at Walmart. Sunset OverDrive Bundle at Best Buy. Sunset OverDrive Bundle at Microsoft. Edited by htz, 06 November 2014 - 04:23 AM. Its great that they are offering this, great deal if you get one with games. Now I wait until Black Friday to see what extras Amazon adds on to sweeten the deal. Yeah, I'm curious as to how retailers approach Black Friday with this. I can't imagine that profit margins are all that high one the consoles as it is. We might see another "buy any console, get any game free" promo, but it's hard to see a way that they can significantly improve upon this offer for that week, unless they say "to hell with profits," and slash the console to $300 or throw in 2 free retail titles. Does anybody know if BestBuy gives the gamer unlocked 20% off for game bundles? I am assuming they don't, but if they do, I'll scoop up the Assassin's Creed Bundle and get a second XB1. Is GameStop a participating retailer? This special promotion will be available nationwide at most major national retailers in the U.S., including Amazon, Best Buy, GameStop, Microsoft Stores, Target, Toys ‘R Us and Walmart. I'm feeling a little salty about this deal now, its definitely a solid promo but there's a small little thing I think they glossed over. Some people such as myself preordered the widely SOLD OUT white xbox one Sunset Overdrive bundle which releases tomorrow...this specific console is part of the deal but sold out at almost all major online stores (Amazon, Bestbuy, ect ect.) I really wish those of us who are getting the white console would be able to take part int his promo since its only a few bucks away from a free copy of Master Chief collection or whatever. ^ Cant you Price Match when the discount goes live? I was thinking this might be a possibility, I'm ordering mine off of Amazon and they are usually pretty good about this sort of thing. Ok. I have the SO bundle preordered there and paid in full with trade credit. If it was best buy it wouldn't be a prob but GameStop only holds preorders for a couple days. If I don't pick up the trade credit card automatically is credited the $399? Or do you think they can hold it until Sunday for me to recoup the $50? Amazon is great, Im 100% positive they'll give you the PM. Return and rebuy might be possible? Im not sure. I would call them and ask them to hold it until the promo starts, then go up, cancel, and rebuy on the spot to get it for the $350. If one retailer is def not going to do a price match its GameStop. Talk about crapping all over the people who are getting the SO bundle tomorrow. Lawl Microsoft you've done it again! Well I knew it was best to hold out. Microsoft getting desperate and its our benefit. Was going to go get the SO bundle tomorrow and use movers coupon. I'll just pay full now, then come back Monday and return/rebuy for $349 and use movers on that. $341 after tax sounds good to me. Will only be my second time using it, saved my last for a time like this. Thanks Op!!! I dunno. Microsoft has tired a lot of things and nothing so far has been able to make a dent in Sony's lead. Im sure they will have a bundle with a game or two. Just contacted Amazon, they will credit me $50 (probably in amazon credit, didn't ask) after I receive my console. Good stuff I might actually buy an Xbox now. If the SO and AC bundles are already only $350 though I wonder what the Black Friday deals will be. $300 for them? Or $100 gift cards? Tough to decide whether to buy now or wait. Blah went ahead and cancelled my SO bundle from Amazon. Oh well, worst case is I can pick it up in store at Target and do a return and rebuy on Sunday. I actually might just wait until BF at this point. Though, if its anything like the white PS4 bundle...it was sold out everywhere but the day it launched (or a couple days after) it was in stock at Amazon again, so it will probably be back by Sunday. This will finally push them over. I dont think Sony can match $350+ games and people with eat this deal up at that price. Maybe a GTA 5 bundle at $399 can happen but unlikely. I would wait if you are on the fence, the deal is good until next year haha. You should have contacted them first, Amazon CS is excellent! Lol... you say "push them over" as if they only need to sell a few consoles to close the gap. Push them over in finally winning a NPD month, and the gap will close considerably with this deal for sure. I hope Sony does something to match since I know people are wanting to buy a ps4 and are waiting for a good deal this holiday. Now....can I use a movers coupon with the cod Xbox one bundle????? I didn't see the part about this being good until January 2015 haha. I guess that means I just wait until Black Friday.